We’ve had a fair while to wait since Sony first announced the PlayStation VR headset – originally known as Project Morpheus – but it’s almost upon us. The virtual reality device will hit stores on Thursday 13 October and we’ve been playing with one in the Pocket-lint office to bring you a full, in-depth review soon. However, until then we thought we should give you an idea of what you get in the box with your PSVR and, perhaps as importantly, what you don’t. That way you can make sure you buy or source anything else needed to make sure you are fit and ready to go with the PlayStation VR from day one. What do you get in the PSVR box? There are plenty of leads and bit and bobs in the PlayStation VR box. Here’s what you will have to unwrap in order to be prepared for set-up. A bit of an obvious one. The iconic headset is clearly the largest item in the box. There are also plenty of protective stickers you have to remove before use – such as on the lenses. A small box, which looks much like the original PS4 only much smaller, has all the connections you need to run the headset. It also has HDMI pass-through, so you can have the headset and your TV connected at the same time. A pair of in-ear headphones with additional earpieces for different sizes. These plug into the in-line remote found on the headset lead. A HDMI cable is provided to hook the processor unit to your PS4’s HDMI out. You then attach your own HDMI cable to run from the unit to your TV. This attaches the processor unit to your PlayStation 4 in order to relay motion information from your headset and the like. Pretty self-explanatory. This attaches the lead built into your headset to the processor unit. The included AC adaptor provides power to the processor unit. This will change depending on your region. It’ll always have a figure of eight connection at one end, but then your own region’s plug at the other. A good selection of levels or tasters of some of the launch titles are stored on this disc for you to try. Should you like them, you can then click “buy” directly and download the full game (at a cost). At least it means you’ll have something to play and trial the first time you set-up your headset. What is missing from the PSVR box? While you get all the components you need for the headset to work from the off, there are still other things you’ll need to get it working or to take the games playing to the next level. They are all fairly obvious, but we thought we’d detail them anyway. You will more than likely know this already, but the PSVR headset runs from a PS4 – either the original or the new PS4 Slim. It will also run off a PS4 Pro when that’s release later this year. If you have a PS4 there’s a very good bet you still have your DualShock 4 controller. You’ll need it, and the light bar on the front, to play the vast majority of PSVR games. It is less likely that you already own a PlayStation Camera. However, it is mandatory if you want to use the PlayStation VR as it is needed to track the headset and any controllers. The current square-shaped model works just fine, but a new rounder version is also due for release at the same time as the PSVR, priced around £40. While a couple of PlayStation Move batons are not essential for all games, there will be plenty that will require them. They allow you to use your hands in virtual experiences independently. Some peripherals, such as a forthcoming blaster gun, also work with them. You might even have a couple of Move controllers lying around from the PS3 days, in which case they work just fine. Otherwise they cost around £30 each when bought new. You do get the demo disc and that’s great initially but you will want to nab yourself some games. These can cost anywhere up to £50 each. To maintain its interest in gaming education, the US Department of Commerce’s Economic Development Administration renewed a five-year grant this week with Becker College in Worcester, Massachusetts. Becker College is the home of MassDigi, an academic program that focuses on the entrepreneurial side of game development, including a 12-week summer program where attendees take a concept to a market ready title. The Economic Development Administration’s grant is for the amount of $583,000. This announcement actually renews a five-year grant MassDiGi received in 2011. In a press release announcing the news, MassDigi says the funds will be used “to promote entrepreneurship, academic cooperation and economic development across the state’s video and digital games ecosystem.” The school also hosts an annual Game Challenge pitch competition where aspiring developers can show off their games and refine ideas ahead of a proper launch. It was only a matter of time until iPhone 7 accessory makers started delivering a slew of cases to bring back the 3.5mm headphone jack. But I didn’t expect the first case that you could actually preorder — Fuze — would come from a tiny Austin outfit’s Indiegogo campaign. For the most part, Fuze doesn’t pack in any surprises. It’s a traditional case for the iPhone 7 and 7 Plus that includes a headphone jack and also recharges your phone. That’s it! But given the outcry against the loss of the 3.5mm port, its basic feature set might still win over some fans. Fuze charges with a Lightning cable, and it packs in either a 2,400 mAh battery (for the iPhone 7 case) or a 3,600 mAh battery (for the larger Plus model). Based on the images and video available, Fuze looks surprisingly thin for a battery case. At 2.9 ounces, it would still add some noticeable heft to the 4.87 ounce iPhone 7, though. Actual Innovation, the creators of Fuze, initially offered the case for $49 as a “super early bird” price on Indiegogo. That backing option sold out fast, so at the time of this post you can either get in for a $59 “early bird” price, or the $69 standard cost. The company claims the cases will start shipping in December, but as always with crowdfunding campaigns, take that timeline with a grain of salt. At least they’re not starting from scratch though — their crowdfunding site points out Fuze is built from an existing case from a longtime MFi (Made for iPhone) certified manufacturer. So far, they’ve raised over $41,000 of a $60,000 funding goal. Fuze isn’t anything truly innovative, but it’s a sign that Mophie and other established case makers should start hustling with their iPhone 7 headphone jack solutions. In China, some court cases will now be streamed on the internet for the public to view across the country. The Chinese government isn’t exactly known for transparency, but this is certainly a step in that direction. As you might expect, not all cases will be aired. The BBC reports “sensitive trials,” like those of human rights activists, may be among the topics excluded from the program. Those court proceedings that are available for streaming can be accessed via a dedicated website. Users simply log on to see a list of cases currently airing across the country. Topics range from drug trafficking to trademark disputes, divorce and murder cases and some of the proceedings can be streamed live as they happen. Back in August, a New Zealand court announced that it would livestream court proceedings for the first time. Kim Dotcom’s lawyers successfully argued that due to “public interest” in the case, the Megaupload founder’s extradition hearings should be broadcast to YouTube. The two sides eventually settled on a 20-minute delay to allow for the removal of any suppressed evidence. This post was done in partnership with The Wirecutter, a buyer’s guide to the best technology. Read the full article here. 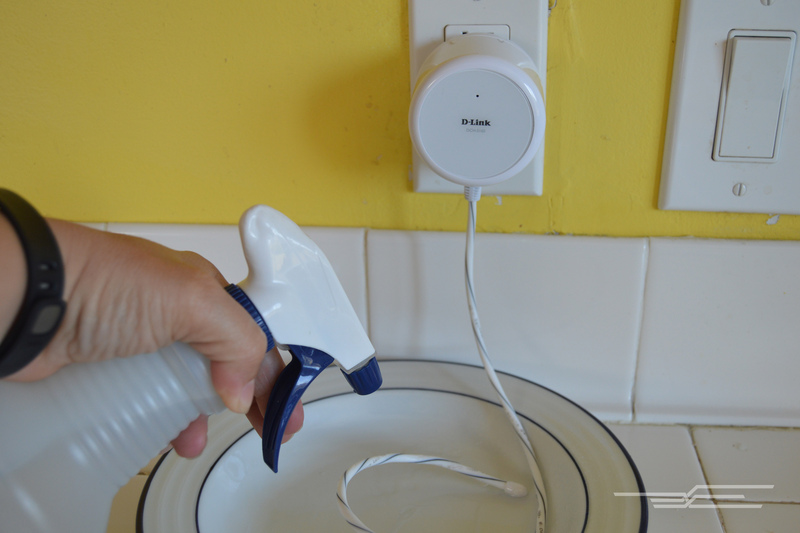 After spending over 10 hours pouring water, mopping it up, and changing wet socks to test the performance of seven DIY leak detectors, we’ve decided that the D-Link DCH-S160 Wi-Fi Water Sensor is the best smart water sensor currently available. It’s one of the few options that doesn’t need a smart-home hub, making it a more affordable solution than the competition because it can work with your existing Wi-Fi network. It can—like the rest of the units we tested—deliver alerts whenever water is present, but it also throws in a few perks that aren’t available on any other smart water sensor at this price. Water sensors are small devices that can alert you whenever water is present around the refrigerator, the washing machine, sinks, and toilets—even in the basement. If you’ve got a leaky basement or appliances of a certain age, a smart water sensor makes for a strategic addition to your home. Some smart water sensors work alone via Wi-Fi, and others connect to a smart-home hub; when wetness occurs, both can send a message to your phone so you can respond with a towel or a plumber. The units we’re talking about here can’t actually shut off the water; they simply alert you to the danger so you can respond quickly. Though you can get a leak sensor that will set off an eardrum-piercing tone for as little as $10, if you want to get alerts and remote access, be prepared to pay a bit more: Our recommendations hover around the $60 mark. We compiled a list of smart water sensors by doing a Google search for reviews and roundups; once we had a list, we looked for feedback on Amazon and Google. Although we found a million different leak sensors, when you factor in the smart aspects, the list of what’s out there is much smaller. We narrowed that list further using features, availability, and price. The average cost for a smart water sensor that fit our criteria is about $60; you really shouldn’t pay more than that. That narrowed our list down to seven products to submit to our water-torture tests—each product is easy to set up, works with an app, and can be used almost anywhere you expect water to make an appearance. For each of our tests, we used apps on an iPhone 5, an iPad, and a Samsung Galaxy S6. Most of the devices used either the SmartThings or Wink hub, so we used the applicable app; when the device connected via Wi-Fi, we used that device’s specific app. When dousing each smart water sensor, we used four different amounts of water to see if it would react and how quickly. We used measuring cups to douse each sensor with one-quarter cup of water, as well as a full cup. We also measured sensitivity using a spray bottle and, finally, by completely submerging each unit in a bowl of water. The main purpose of these devices is to alert you to water, whether you’re at home or away, so we made sure each detector delivered those alerts to a mobile device from afar. Anything beyond their basic features was considered a bonus—for instance, quite a few of the devices on our list allowed you to check on room temperature and even battery life. 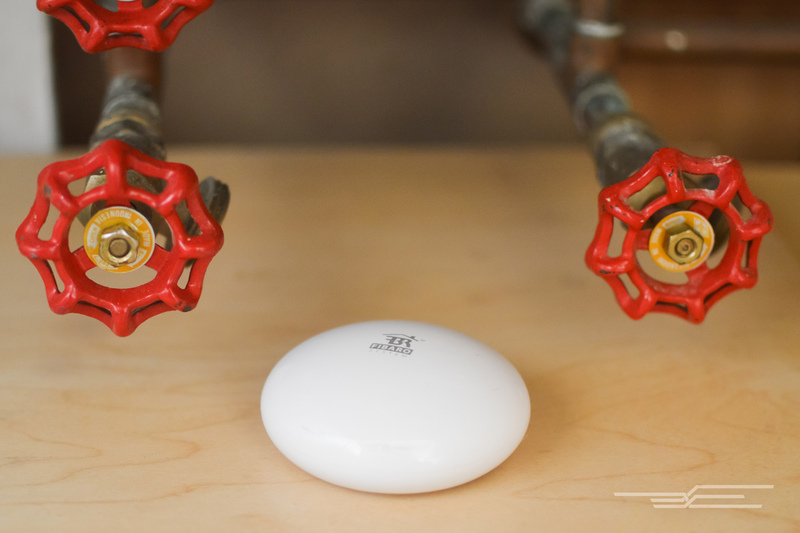 The D-Link DCH-S160 Wi-Fi Water Sensor is a reliable smart water sensor that’s also affordable. It’s actually the least expensive option we tested—not coincidentally, it’s also one of the few models that doesn’t need a smart-home hub. Instead, it uses Wi-Fi to deliver water alerts through the mydlink Home app (available for iOS and Android devices) and integrate with other smart devices in the home. It’s also the only model on our list that relies on power from the wall rather than a battery. The D-Link device performed well throughout our testing, sending out alerts about six to 10 seconds after the sensors first touched water. It also features an audible alarm that you can hear from about 35 feet away, though that sound doesn’t travel as well through floors. 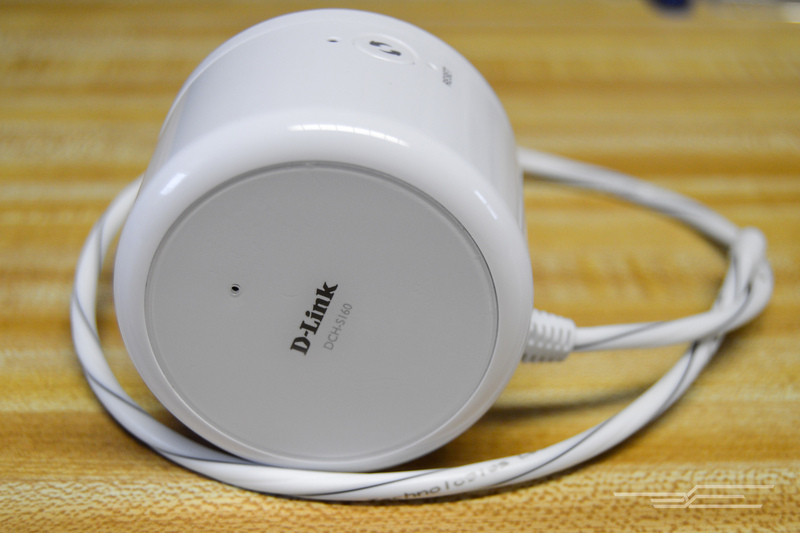 The app associated with the D-Link DCH-S160 Wi-Fi Water Sensor—mydlink Home—is pretty basic. Other than a record of when water was present, it offers options to change the device’s name, add in a personal photo, and create rules. For instance, we set the device to send both push notifications as well as an email whenever water was present; texting is not an option here. For a stand-alone device, it does offer a few integration options as well. If you search the D-Link Water Sensor channel on IFTTT, there are ways to get phone calls, post to Slack, trigger the Nest thermostat, and more. It also works with other D-Link Connected Home devices, which you can control and set up integrations for from the same app. The Fibaro Flood Sensor features an audible alarm that also triggers when someone tilts or tampers with the device in any way. It has a temperature sensor and a visual “drop” display that can change color based on if there’s water, weird temperatures, or bad network connections. As an added bonus, this little circular device can actually float—which can end up being a huge bonus if a leak turns into a flood. 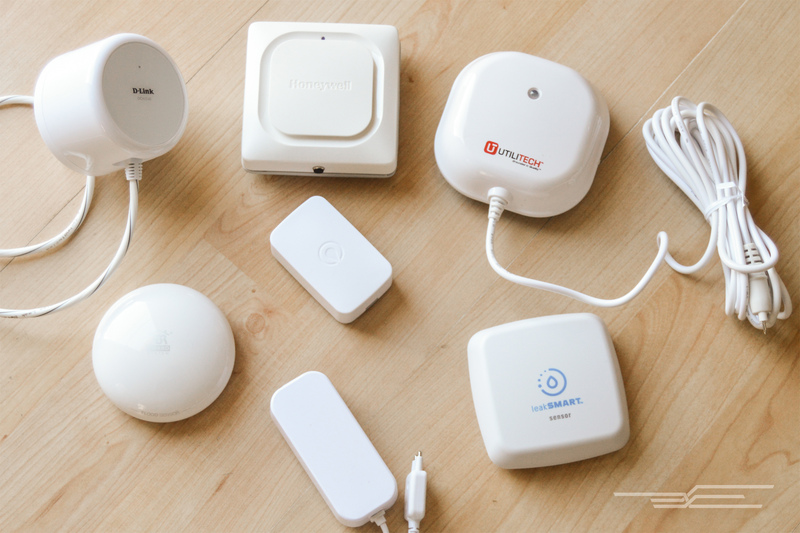 However, unlike the D-Link, it requires a smart hub, a requirement that kept it from being our top pick. “The Obama Administration’s decision violates the Property Clause of the US Constitution by giving away government property without congressional authorization, the First Amendment to the U.S. Constitution by chilling speech and the Administrative Procedure Act by acting beyond statutory authority,” Texas Attorney General Ken Paxton’s office explained in a statement. The Republican attorneys general echoed the sentiments of their fellow party members, arguing that the move would give authoritarian governments like China, Russia and Iran more power to censor the internet. Those three countries will participate in the international governing body that will oversee the internet and domains. Attorney General Paxton argued that trusting those governments to lend a hand to maintain the freedom of the internet was “lunacy.” The group also cites security concerns over the .gov and .mil domains after the transition, but supporters of the transition say that those won’t be affected by the change. In an open letter on TechCrunch last week, a group of Congressional Democrats slammed Republicans for their resistance of the transition. The group of five Senators and Representatives reminded their counterparts, and the general public, that the US doesn’t own the internet. When Microsoft announced they’d won the bidding war for LinkedIn with a colossal $26.2 billion offer, it seemed, well, about as interesting as corporate enterprise acquisitions sound. Yet it’s a shrewd move for both: Integrating a business-oriented social network into Outlook or Windows would be promising for the software giant, while LinkedIn gets stability under its new corporate umbrella. But not everyone is happy about the deal: Salesforce is urging the European Union to block it, claiming the union would be anticompetitive. Specifically, Salesforce’s chief legal officer Burke Norton argued that if Microsoft owns LinkedIn’s dataset of “450 million professionals in more than 200 million countries,” they could deny competitors from using it. But even the combination of software and social information could give an unfair advantage, sources told The New York Times. Of course, the company is hardly unbiased: Salesforce had a competing bid for LinkedIn. Microsoft fired back, noting that the deal has already been cleared in the United States, Canada and Brazil, and that the advantage would not outpace Salesforce’s existing dominance in the customer relationship management (CRM) market. Whether the EU competition authority ends up blocking it or not, the call for scrutiny could lead to a deeper investigation into the deal, potentially dragging it out for months longer. The Lifx Z color-changing light strip. 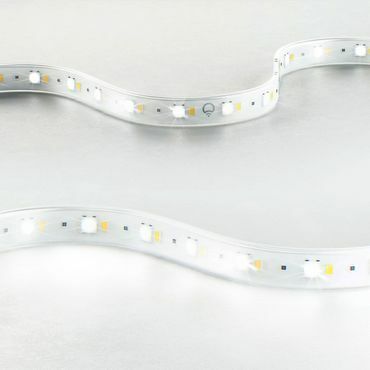 Lifx has been pitching the appeal of color-changing smart lights for years, but their family of connected LEDs has always lacked a light strip that you can stick up beneath cabinets, behind entertainment centers, or in other hard-to-light spots in your home. Today, that changes with the introduction of the Lifx Z, a color-changing smart strip that’ll work alongside the rest of the Lifx lineup. A starter kit that includes the base plug and a 2-meter strip will sell for $90 (£70/AU$120), with additional one-meter strips selling for $30 a piece (£25/AU$40). You’ll be able to connect up to 10 meters’ worth of strips to a single base station, with plugs available for outlets in your specific part of the world. Once you’ve snapped everything together and stuck the strips where you want them, you’ll use the Lifx app on your Android, iOS, or Windows device to pair them directly with your home’s Wi-Fi network. From there, you’ll be able to control the color and brightness of the strips from your phone, or with Alexa voice commands on the Amazon Echo smart speaker. You’ll also be able to trigger the strips using the free online automation service IFTTT. Lifx Z seems designed for direct competition with the Philips Hue and Osram Lightify, both of which offer their own comparably priced plays on smart, color-changing light strips. Both alternatives require gateway devices to connect with your router, though, and that might help Lifx Z set itself apart, since it connects directly with your home network over Wi-Fi. Preorders for Lifx Z start on October 1st, alongside a new line of “Lifx Plus” smart bulbs that use infrared light to help night vision cameras see more clearly. All of it is expected to ship out in November. A Lifx Plus on the porch helps this night vision camera see a man outside the window it couldn’t see otherwise. Connected, color-changing light bulbs are a fun way to smarten up your home’s lighting, but the new Lifx Plus wants to smarten up your home’s security cameras, too. Its trick? Invisible infrared light that shines out into the darkness when the bulbs are turned off. You can’t see that infrared light, but night-vision cameras can, which makes it easier for them to see what goes bump in the night. It’s a pretty clever idea. Night vision cameras from names like Arlo, Nest, Canary and iSmartAlarm see in the dark by emitting their own pool of infrared light, but they can’t see things in places that infrared light can’t reach. With the Lifx Plus, you can effectively give those kinds of cameras a boost by lighting up dark spots in and outside of your home. Each Lifx Plus bulb will cost $80 (£60/AU$105) when it ships out this November, with multipacks available at a discount. It’s available as both a standard A19-shaped bulb and as a BR30-shaped floodlight that you can use outdoors. At $80 each, the Lifx Plus costs $20 more than than the previous-gen Lifx Color 1000. That might be tough to swallow, given that these bulbs were expensive to begin with, but still, 20 bucks extra feels more or less fair for the novel addition of night-vision assistance. The Lifx Plus smart bulb, available as both a standard A19 bulb and a BR30-shaped floodlight you can use outdoors. Beyond the new infrared trickery, the Lifx Plus bulbs will function just like existing Lifx bulbs, complete with full color controls and a full spectrum of white light settings, too. They still use built-in Wi-Fi radios to sync directly with your home network, so you still won’t need a hub to use them. Once they’re screwed in, turned on and synced up, you control them using the Lifx app on Android, iOS or Windows devices. You can also control them using Alexa voice commands on the Amazon Echo smart speaker or with automation recipes on the free online service IFTTT. Each Lifx Plus bulb draws 11 watts and puts out 1,100 lumens at peak brightness. That puts them right on par with 75-watt incandescent bulbs, and also makes them a touch brighter than the Lifx Color 1000. We’ll be sure to compare the two when we test the Lifx Plus out in the coming weeks. Of course, with nothing new beyond the infrared light, there’s really no reason to upgrade to Lifx Plus if you don’t use cameras in your home. To that end, Lifx will continue selling the Color 1000 LED, with discounts planned for the month of October. 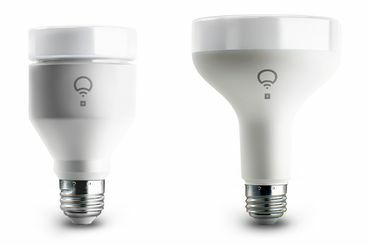 We’ll also be sure to take a look at how Lifx Plus stacks up against Philips Hue, its main color-changing competitor. Lifx has long enjoyed a color accuracy advantage over Hue, with noticeably better greens and blues dating back to generation one. However, Philips recently answered back with a new and improved, third-gen Hue bulb that puts out better, richer colors across the spectrum, along with lower prices for last year’s second-gen bulbs. Preorders for the Lifx Plus start on October 1, along with a new $90 “Lifx Z” light strip starter kit (£70/AU$120). The A19-shaped bulb comes with your choice of Edison-style screw-in base or a bayonet-style base designed for homes in the UK.